ABI REIMOLD TTN Student-activists with Temple Community Against Mountaintop Removal staged a sit-in at yesterday’s Board of Trustees meeting. Members said they wanted to bring their cause and concerns about student voices at the university to light. Trustees approved a number of items as student-activists sat-in at their meeting. Not on the schedule of speakers at yesterday’s Board of Trustees meeting, student-activists sat-in and addressed the university’s top-decision makers before the board approved a slew of actions recommended from its committees. Members of Temple Community Against Mountaintop Removal, a student-activist group associated with Occupy Temple that seeks to end the practice of mountaintop removal coal mining, demonstrated before the board yesterday, March 12, for the second time. The group first surfaced when it protested at a public session meeting in October 2011. 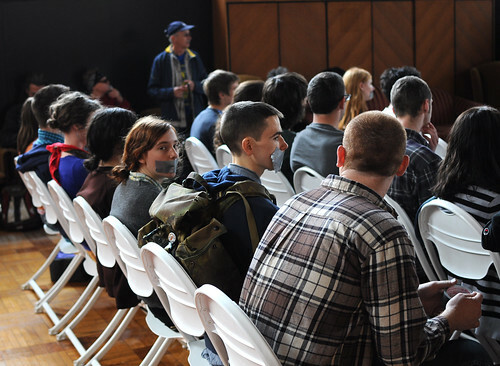 Donning tape over their mouths, members of the group and of several other campus organizations, including Temple Democratic Socialists and Students for Justice in Palestine, stood in front of their seats in the Feinstein Lounge of Sullivan Hall silently as the meeting began. When President Ann Weaver Hart finished delivering a report about student leaders on campus, the group chimed in. “Speaking of student leaders…as students, we feel we deserve a better manner for dialogue, engagement and decision-making with the administration. Until these manners are made available to us, it is our statement that we have no voice,” the activists chanted, following the lead of senior Latin American Studies major Ethan Jury. The board did not verbally reply or recognize the student-activists or their claims, but continued its agenda following the brief action. Ray Betzner, assistant vice president of university communications, said the administration has met with the activist group, citing meetings between TCAMR members and Dean of Students Dr. Stephanie Ives and Associate University Counsel Valerie Harrison. The members also met with Hart and Patrick J. O’Connor, chairman of the board, after the October 2011 public session. Following the verbal action by the activists, O’Connor led the board in quick unanimous approvals of recommendations from committees. The board approved the appointment of Dennis Alter and Edward Rudolph as state-appointed voting trustees. Recommended by the facilities committee, the board approved a number of construction actions, including the $17.5 million design of the new library on Broad Street proposed in Temple’s 20/20 plan. The board also approved an increase of $37 million for the construction of the science education research center, which will total $137 million. Finishing renovations of Pearson and McGongigle halls were also granted an increase of more than $1.5 million – a project with a cost of more than $59.8 million. A 4.5 percent across-the-board increase in university housing rates for 2012-13 was approved, as recommended by the student affairs committee. The increase ranges from $288 for Johnson and Hardwick and Peabody residence halls, to $378 for Triangle Apartments. When O’Connor adjourned the meeting, board members were invited to meet with student representatives at Pearson and McGonigle. As trustees and administrators shuffled out of the lounge, the group of activists once again addressed the room. Trustee Emeritus Edward H. Rosen, who said he was an invited guest at the meeting, met with members of TCAMR following its close to listen to their concerns. This is great, BUT what I’d like to see is coordination and focus between the student groups. Yes, a group of students doing a sit in at a Board of Trustees meeting makes a point worth making, but if many thousands of students at hundreds of universities around the country/world all acted together at the same time the impact could be staggering. It takes LEADERSHIP at the local university level, it takes COMMUNICATION between those leaders via our wonderful tool on the internet, and it takes COMMITMENT and follow up. The first two parameters are easy, there are excellent leaders in student bodies and we all have the communication tools at our fingertips. The hard part in maintaining commitment in the minds of students… this circles back to leadership. I recall Earth Day many years ago… and we didn’t have the internet available to our effort. I think that it is important to address Mr. Betzner’s comments regarding our request to be in communication with the “university” and that we have been carrying out a dialogue ever since. This a half truth. We certainly want to have communication with our university. This includes administrators with whom we have regular discussion, faculty, staff, and of course the ultimate decision makers at Temple based on its By Laws, our president and the Board. Although we were able to meet with the Board and the president, it only happened once and it was improptu AND the invitation itself appeared to be a tactic on the part of the Board to defuse a potentially volatile situation when we brought 70 people to a Board public meeting. The conversation lasted about 15 minutes. Since then we have not met with any members of the Board nor the president despite constant requests to do so. More to the point, faculty more than any other members of the Temple community are aware that the Board has deliberately, and through the Temple administrative policy itself, been excluding everyone except Board members from decisions about the future of the university. Faculty members that speak up to much about this risk losing their job. What kind of free and democratic society can function with large educational institutions that have anti-democratic policies and tendencies at its core? This is what the protest was about. We demand that we have a tangible say in what happens at Temple, and so we demonstrated this demand at the public meeting on Monday. Thanks for the comments NYLS and hebintn. I agree 100%, there ought to be a coordinated effort of 1000’s of students across the nation, prepared to shut down their universities for righteous causes. As some one that has been working with these student leaders, I must say that there is a great deal of coordination between different groups. Many of them work tirelessly, moving from one meeting to another, travelling to different states for conferences, and showing up on a weekly basis for confrontations with power. I would urge you to recognize that this is only the beginning. Resistance movements grow like trees, not weeds. They take time. As we have seen in our efforts to coordinate and organize, there is a great deal of complacency amongst most of our peers and most of the people in this country. This is of course no secret to either the activists nor the complacent themselves. All I can say is that these things take time and that I would encourage you to come to one of TCAMTR’s meetings (Fridays at 4PM in the Mezzanine of Gladfelter Hall), or Occupy Temple’s, or the Temple Democratic Socialists, or the Students for Justice in Palestine. Anyone can make suggestions from the sideline.